This is as pretty as they come. 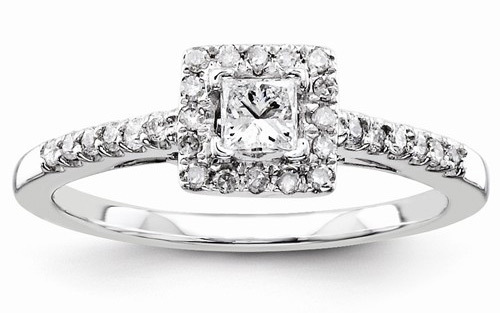 A square halo diamond design 1/2 carat engagement ring holds a princess-cut diamond center crafted in 14k white gold. Center diamond is a 0.25 princess-cut quality diamond in H-I Color, SI1-SI2 Clarity. This diamond will shine and sparkle with few inclusions. Side diamonds are 0.22 carats in H-I Color, I2 Clarity, for a total of 0.47 carats. The square halo design around the center princess-cut diamonds makes this engagement ring pop with a larger overall look that equals a 1 carat diamond ring. Available in sizes 5-9 (please allow 5-7 business days, as we make each ring individually made to order. 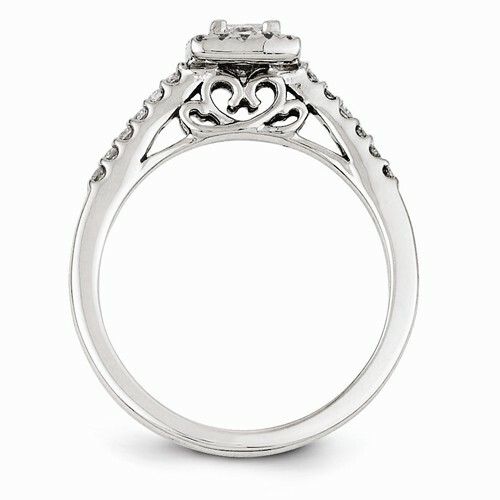 Also available in a round center diamond design (shown below). Apples of Gold Jewelry guarantees the 1/2 Carat Square Princess-Cut Diamond Engagement Ring to be of high quality and an authentic engagement ring with real diamonds, as described above.